Internet companies are getting very aggressive at asking you to add phone numbers and secondary e-mail accounts to your profile. Just today, Outlook.com asked me to add a phone number or a secondary e-mail address. It won't let me enter my Outlook.com e-mail account without adding one. I have no intention of giving up more privacy by giving companies more information about me. I'm very sensitive about giving out my personal phone number. And what if the Outlook.com e-mail is the only e-mail account someone has? So I was forced to look into a workaround just to get access to my Outlook.com e-mail account today. The work-around is to use a disposable e-mail as a secondary account. I wouldn't use a disposable e-mail that gives you a random name; you may actually need it for security verification. Instead, you should use a disposable e-mail where you can select a name yourself. Two disposable e-mail services comes to mind: 1) mailcatch.com; and 2) yopmail.com. You can create whatever random e-mail account name using these two services. You'll want to pick something that is quite unique to you. Then give the disposable accounts to Microsoft Outlook.com or other nagging online services. 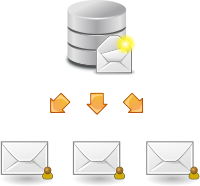 When you need to, you can check these disposable e-mail services for security communication.